What is Functional Protesting, and why is it important? You may be wondering what is functional protesting. When a student has no way to communicate that they don't want something or they are finished with a non-preferred activity or maybe need a break, many children learn to "say" it by displaying negative behavior. Unfortunately, due to lack of education and training, many educators and parents unintentionally reinforce this negative behavior and comes to the point of just survival. 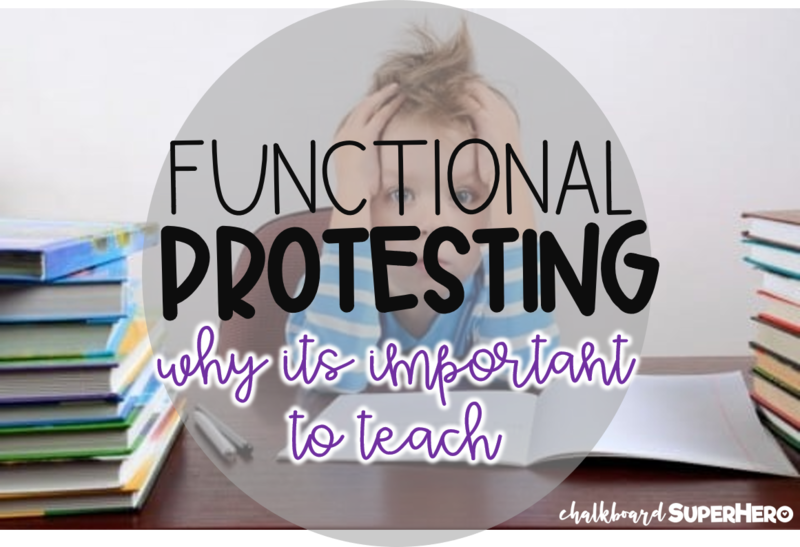 When you have a child that is tearing up your classroom, or becoming so aggressive that nothing else can get done and you are pulling your hair out, you need to teach the skill of functionally protesting. What is it? When you have a student who is non-verbal or even low verbal, they need to be able to communicate in an appropriate way, how to say "I need a break" or "I don't want to do this anymore". Because we, as educators, don't want them to take a break, we want them to be able to push through it, we forget that we NEED to teach them how to also say "I don't want to". Typical peers are already able to do this. Just because some of our kiddos don't have words, doesn't mean they don't get to protest either. What should I use to teach this? There are many different ways that you can teach this skill. But first, you have to identify the form of communication that your child is currently using. Whether they are using a PECS books, an AAC device, verbal language or sign language, you need to first teach them that they can ask for a break. STEP 2: Identify a break space- this can be a separate room, or location within the classroom to be able to take a break from the preferred activity. Typically when they ask for a break, they should have nothing "fun" in this area. No games or toys. Typically you would want maybe some sensory items, some soft lighting and low playing music. 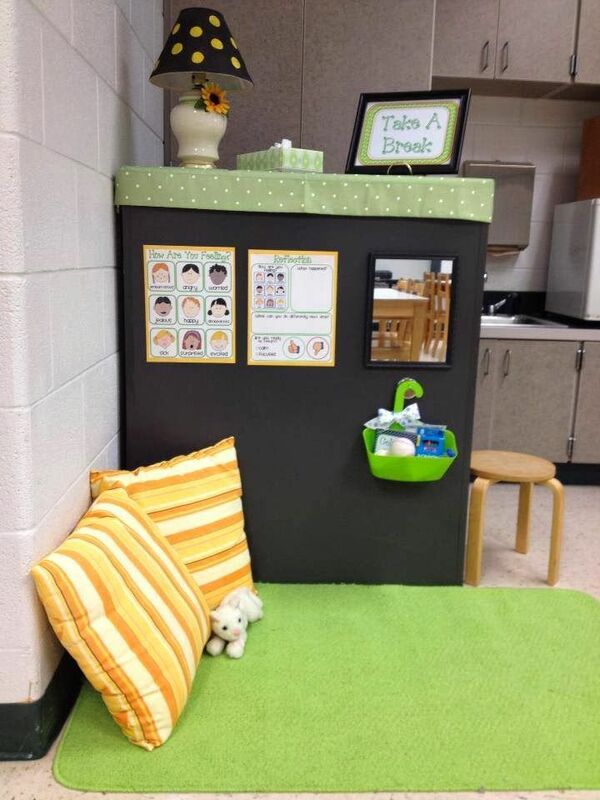 break space located within the classroom or a close room near by. STEP 3: Teach the new vocabulary, " I need a break". This can look differently for each child. For example, I have a student in High School who is low verbal, meaning that when she needed a break, she would tear the room upside down for 7 hours straight, until dismissal time at the end of the day. We created "break" cards that had written words, and a separate break room. She was able to verbalize " I need a break" with the picture prompt. 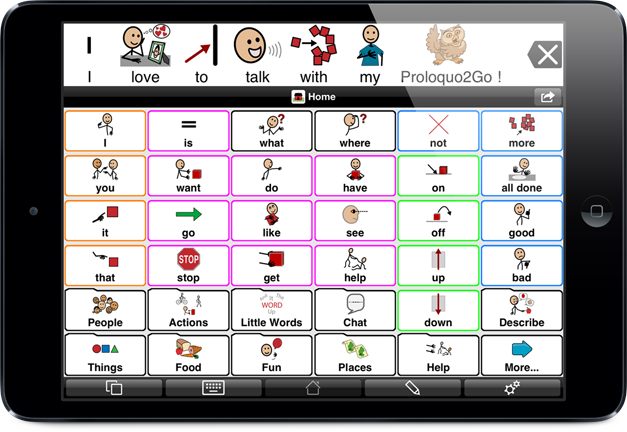 You could also program this button in the AAC device, or put a "break" symbol on the front of the PECS book for easy access. Another way to teach this is by video modeling. You can have you and another teacher model this skill using a cellphone or tablet and show the student. You can create a social story with how to use " I need a break"
STEP 4: Honor it! Every time they actually say "I need a break" you need to honor it immediately. Even if the child asks for a break 50 times in one day, this needs to be honored. They are learning a new way to communicate and it may take a while for them to understand that they actually have a voice. I cant stress enough, that they need to immediately take a break. When they do "ask" the teacher needs to say, "oh you want a break" and lead the child over to the break area. STEP 5: Set a time. 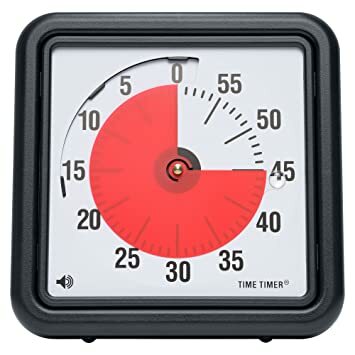 Whether you use an egg timer, a cellphone alarm or a time timer as pictured above, you need to let the child know that when the timer beeps, back to work. There are many times, when I will go back to the child when the timer beeps, "okay its time to go back to work" and the child will use the skill again and say "I need a break". I will honor this every time, as long as they are using communication functionally. STEP 6: Teach the team. Everywhere the child goes this, they should be able to request a break and have it be honored. It is really important to be able to be consistent across the board. If you cant be consistent, the child may not learn the new skill. There you have it. Your student can finally protest functionally. Now, you may be wondering, how on earth am I going to be able to get them to do any work, if all they are doing all day long is requesting a break, and not doing any non-preferred activities. This method is used to train the student to ask for a break. Once this skill is mastered, you can introduce limits. For example, let's say you have a 90 minute ELA block, you can give them 6 break cards and let them know, they can only take 6 breaks, once those are gone, you cant have anymore. Once they understand the concept of only having that many cards (a limit), you can begin to fade this down. Eventually, you should be able to fade them altogether. Are you looking for some already, pre-made, visuals? Check this out! !